My partner and I had such a great experience working with Nikolina at Andrea's Vintage Bridal. I know as much about vintage dresses as the next decently hip, young Minneapolis resident. I knew it would take some work to make the dress what I wanted exactly (true for most dresses- unless you want to go with the fully authentic vintage look-also so cool!). I knew that vintage dresses were small, and I knew that they often had super poofy sleeves. Awesome. The dresses were all so fun and truly unique. The best part, however, was wonderful atmosphere that Nikolina created for myself, my partner and the rest of my little group. I absolutely was not not (NOT) looking forward to shopping for a wedding dress. Frankly- I was pretty grumpy about it. I hated the whole idea of being the center of attention and buying a fancy outfit made someplace far away that I would wear once. However, within the first 10 minutes I was completely at ease! This was not one of "those" wedding shops. Nikolina was the perfect combination of direct, knowledgeable and empathetic. She selected beautiful dresses for me to try on and I found several that I truly liked during the appointment. I ended up leaving with a beautiful dress the next day that I am very happy with! I could have probably gone on ebay and found a "vintage style" dress that met my needs for dirt cheap. But working with this business, with all of their knowledge and passion for what they do was such a great experience. It meant a lot to everyone there. My dress is beautiful, high quality and truly unique. A final note: queer friendly space! I am forever grateful and indebted to Andrea and Nic. The entire experience from start to finish has been nothing but a dream. 1. Choosing: I sent a few pictures over of dresses I liked, but was blown away by the service on the day I shopped their racks. They let me try on probably 20 dresses and were excellent about taking my honesty on what was working and what wasn't. They helped me envision how we could recreate things, what looked good on me, etc. Especially if you don't have a mother or someone close to go with, they were just simply fantastic to help me think this through. 2. Pricing: Unbeatable. You will never find a dress so unique, well-fitting, and well-made as you will when you purchase your dress at Andrea's. Even if you think vintage isn't for you because you want something all your own, that's what you get! I completely reinvented my dress from what I purchased. Which reminds me, the on-staff seamstress Emily is magnificent! 3. Selection: It's huge. Dresses from all decades, long or short, ornate or simple, it's perfect for just about anyone's style. 4. Jewelry: It's great! I bought my earrings there, too, and they were priced very reasonably. 5. Amazing ownership: Andrea's is a family business and the personal touches start from the moment you walk in the door and even after the wedding. I just bought my vintage wedding dress from Andrea's. I didn't think I was the type to have the "wedding dress" experience, but when I put on my gown I knew it was perfect. I truly feel that this dress was waiting for me. Shopping at Andrea's will be a different experience than you'll get at any other bridal boutique. I enjoyed working with Nikolina. She loves the dresses that she has in her stock. It takes some imagination to envision what these vintage wedding dresses will look like after alterations, but Nikolina does an amazing job of painting a picture. I'm so excited to have the opportunity to reuse a vintage wedding dress and customize it to fit my vision. If you're looking for a unique wedding dress that is one of a kind you need to go visit Nikolina at Andrea's Vintage Bridal! I purchased my wedding dress from Andrea's Vintage Bridal a few weeks ago and had a fabulous time! This place probably isn't the right store for you if you're in the market for more of a classic "princess" dress - but if you want something truly special (in the unique sense; I hope all brides think their dress is special in the meaningful way! ), this is the place to go. I recommend going in as a blank slate - they have sooo many different options that I didn't want to limit myself at all. Andrea, the owner, has a great eye regarding what she buys and is so warm and welcoming. Her daughter, Nic, runs the show during the appointment, pulling dresses to try on and I think she has good intuition with what people like and tries to present the right dress for the right person. Your group is in there alone, which makes it a really great, intimate experience. And Pierre, their big white poodle, also helps add to the friendly atmosphere in the shop! They truly enjoy what they do at Andrea's and it makes for an amazing, one-of-a-kind experience. I went to Andrea's Vintage because the idea of re-using a gown was appealing to me, as was a small/un-crowded shop (you/your friends are the only ones in the shop for your appointment). This store may not be for everyone, but if you have an open mind and are a little bit creative, you can walk away with a one of a kind dress. Nikolina is amazing; I sent in my size and height/weight and she had 20ish dresses ready for me to try on at my appointment. She helped narrow them down and during the whole process, I never once felt rushed or pressured - I was honestly dreading dress shopping. However, the one on one attention and Nikolina's fun personality made this the best experience of my wedding planning process! I worked with their recommended seamstress, Emily, and absolutely loved my dress. This shop and the whole experience was amazing! 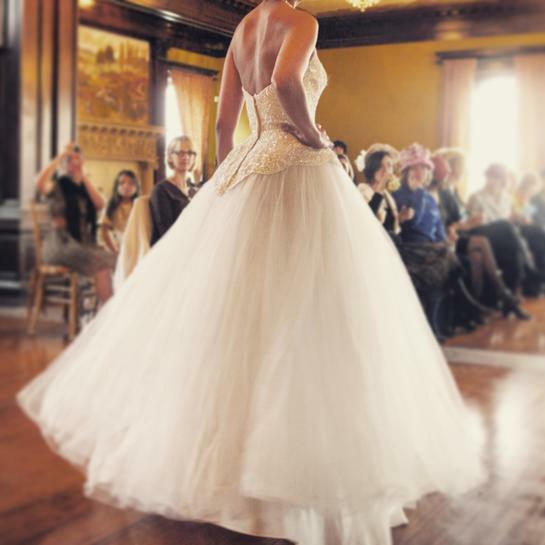 I had an incredible, enviable experience buying my wedding dress from Andrea's Vintage Bridal. I had heard about the store online and as a lover of all things vintage, knew I had to check it out when I visited my family in Minnesota for Christmas. I had been to one more typical bridal shop where the sample dresses didn't fit me and everything was way above my price range. My experience at Andrea's with Nikolina was completely different. I felt perfectly comfortable and just had fun trying on dresses. Nikolina was so helpful in showing me the potential of every dress that I tried. When I found the dress that I loved, it had a very 70's waistline and it was about 6 inches too short. With Nikolina's vision, though, I could picture it being the perfect portrait neckline, keyhole backed dress of my dreams. I didn't walk into the store expecting to buy a dress that day - in fact, I had another appointment set up at a more typical dress shop later that day! But when I found the dress, I knew I had to act on it. Nikolina set me up with a seamstress, Emily, that the shop often works with who was able to fit me in that same weekend for my first fitting. Emily worked magic on my dress, creating a final product that was better than I ever imagined. I absolutely loved wearing my dress and also love the whole idea behind it - that it was vintage and worn before, but also that I got to help create it into something unique and just perfect for me. For anyone who loves vintage styles, please do yourself a favor and check out this gem of a shop. Nikolina was amazing! She helped me find the perfect dress. I'm a size 12/14, and I never felt like I had limited options because of my size. I worked with Emily, the seamstress Nikolina recommended, and everything went very well. I'm so happy! Going to Andrea's was my first wedding dress shopping experience. I walked in and had a dress picked out and purchased 45min later. Nik picked out amazing dresses that were in budget and was able to really describe and make me understand the potential that each dress had. They are not your typical wedding dresses, but if you are looking for something a little different but still classic, they are wonderful.